As professor of learning sciences at the Graduate School of Education at University of Pennsylvania, Yasmin Kafai is a research pioneer in the field of gender and gaming. Kafai explores the ways in which gender stereotypes propagate in game culture through game play, and through the years, her research has focused on children’s learning as players and designers of educational software, video games, and virtual worlds. Her practice of constructionist theory stems from her early beginnings working with Seymour Papert’s research group at the MIT Media Laboratory. Kafai was an integral part of the first wave of developers and researchers of Scratch for the Computer Clubhouse network, which continues to serve as a key model for after-school activities all over the world. 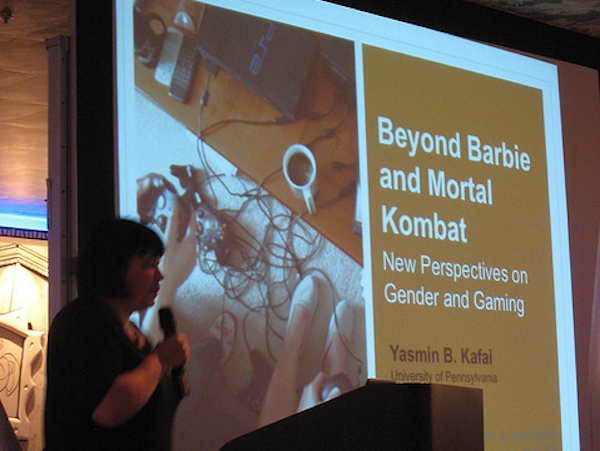 In 2008, Kafai co-edited Beyond Barbie and Mortal Kombat: New Perspectives on Gender and Gaming to survey how gaming culture has changed in the decade since Justine Cassell and Henry Jenkins’ groundbreaking book From Barbie to Mortal Kombat was published. We spent a few moments with Kafai to discuss what effects long-standing social and cultural attitudes and assumptions have on gender and gaming. When did you first become interested in a constructionist learning approach, and what about it has stuck with you throughout the years? I was a student of psychology in Germany when I first heard about Seymour’s work. His book Mindstorms had just come out, and for me, it really provided an alternative way to think about learning with technology. Constructionism allows you not just to think about learning by making, which is probably our closest conceptual ally, but also to think about the social context in which that activity takes place, and then it also offers a wonderful design perspective. It’s not just about studying and understanding learning as doing, but it’s about how we can make activities or instruction kits that help learners in the process. My most vivid illustration of this took place almost 20 years ago when I first looked at children’s programming. Some of the children were making their own software applications, and I noticed when we talked the topic of games, they always told me, “I really want to learn how to make my own game.” This became the inspiration for the first game design study project in the 1990’s. We designed a whole project that focused not simply on programming your own games to help others learn but on connecting this activity to other school-based subjects such as mathematics and science and even art class and language arts coursework. For me, game making — learning for making — was never just about the technology-activity, but more about a holistic approach to learning and teaching in a particular context. What issues, time and time again, prove most difficult to resolve in respect to gender and gaming? This illustrated for me that the issue hasn’t gone away and that many of these values and perceptions on what kind of activities and games are for whom have fairly deep roots in our society, even though they are not really reflective of the larger trends of society. We do know older women are gaming now in massive numbers in what’s called “casual games.” The name is already a bit pejorative because it implies “not serious,” but if you count up all the hours these women play, you will see that it turns out their investment is as serious as you will find for many of the massive online role-playing games. We also know games like the Sims are very popular with female population. These things were just at the cusp when we decided to write the chapters of Beyond Barbie and Mortal Kombat. But while we do have a much richer online space since then, we still haven’t seen quite as much of a shift as we’d maybe expected in game design and in the commercial sector. This larger issue about the lack of female participation is not unique just to the game industry; it’s actually reflective of the technology industry at large. In terms of culture and of pathways into computing, technology, in contrast to the fields of mathematics and science, hasn’t made a lot of progress in opening its door and clubhouses to different communities. People such as Leah Buechley ask, why do we always have to return to this question of opening these same doors and clubhouses? Perhaps we should also think about creating new clubhouses, which create new opportunities and activities to engage groups such as women and underrepresented minorities and bring a wider fold into the technology community and game design at large. This year, while attempting to break down “building” stereotypes for girls, Lego was criticized for reinforcing gender stereotypes. Are we returning to “pink box thinking” when attempting to appeal to youth? Clearly we have definite views to which colors and activities are appropriate for girls and boys, but this tends to neglect this greater variability of what boys are interested in and what girls are interested in. In reality, you will actually find much more overlap and a whole range of engagement. Take for example the Scratch community, whose participants are 37% female, which is a fairly large percentage, especially for a technology-driven community. There are girls who are very geeky and are interested in programming — they just might not be interested in programming shooter games — but they are interested in the technology engagement, and likewise you will have many boys whose interests lie in a variety of activities. That doesn’t come out in the conversation when people start marketing to particular groups. Everything gets essentialized. It’s assumed that there is one driving interest, but research points out that interests are in fact much broader. I am really not happy with the term gender-neutral because there isn’t neutrality in the territory. We have certain cultural and social expectations and practices around gender, and the best you can do in designing games which appeal to a large audience is allow for multiple ways of identification and engaging activities. A very simple thing you can do is let players choose a protagonist, even allow them to customize their protagonist so it is more to their liking. All technology is designed to build richer play, and by that token you appeal to a larger audience. It may not be neutral, but it will allow for different interests to engage. If there are particular characters or activities that seem to be gendered, there needs to be a space for kids to discuss this. What are the challenges and realities in designing games for educational purposes? We have very firmly implanted beliefs on what role games can play in learning, and this discussion that games are part of our technology landscape and can be used in very effective ways has only recently opened up in the last few years both on the academic and commercial levels. The reality is that there is so little room in the school day. If you talk about bringing games into education, similar to how Seymour Papert talked about bringing computers into schools, it was never really about the technology — it’s really about bringing a different pedagogy. What we’re seeing right now is schools like Quest to Learn and many charters and many experimental schools where people create very compelling models on what that would look like where game design activities and constructionist activities have a central part in the curriculum. At the same time, these schools really bring the 21st century technology activities into all of the classroom work, not just in the lab where you go once a week for 45 minutes to do something on technology and come back to your old-fashioned way of doing school in the classroom. The truth is, everyone who has played games or even made games knows these things take a lot of time. Whatever you allot for over a period of 45 minutes in the lab is just an appetizer. To make the full transformation, we need to create something that mirrors this long-term investment in engagement and making things. If we do that, we will eventually see and reap the benefits in the educational context. Is there something you’ve designed in particular that has had a lasting effect on your own learning development? I have always been a designer and a maker. My design roots are more in the area of traditional crafting. When I think about game making, I think about crafting something that used to be predominantly on the screen, but we now have a whole range of interesting activities. My current research is in the domain of electronic textiles, which combines very beautifully my early experiences of making and designing all of my own clothes. Knitting. Weaving. Anything you could make, I did. It just wasn’t legitimate for the last 20 years to talk about these things in the context of technology learning because we devalued manual design work. What’s been happening recently, both in the electronic textile and the DIY making area, is that these things, in conjunction with design technologies and programming technologies, are making a comeback and providing a really fantastic context for developing great skills — expressing yourself, making things that are reflective of yourself, and critically engaging in the impact and involvement of technology. That’s where I see my roots. Gaming came across my path by sheer accident because when I started 20 years ago nobody talked about games and learning. At that time, players making their own games was really not acceptable in the education community nor in the gaming industry. Today, playing and making games yourself, as well as many other making your own technologies is really becoming part of a broader movement.